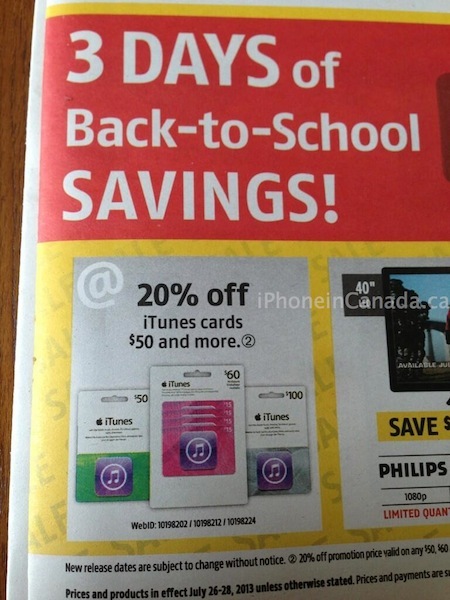 If you’re looking for an iTunes Card sale then look no further to an upcoming sale starting tomorrow until Sunday at Future Shop. All iTunes Cards $50 or more will be 20% off. The benefits of funding your iTunes Account with only these discounted cards means any digital purchase you make from the App Store, iBookstore, iTunes or Mac App Store is 20% off. Plus, it’s a great way to fund a limited iTunes account for your child so you don’t end up with a $3,000 bill like this woman in Newfoundland.